I get plenty publicity kits, and most of the time I have little interest in whatever it is some publicist or manufacturer is hawking. 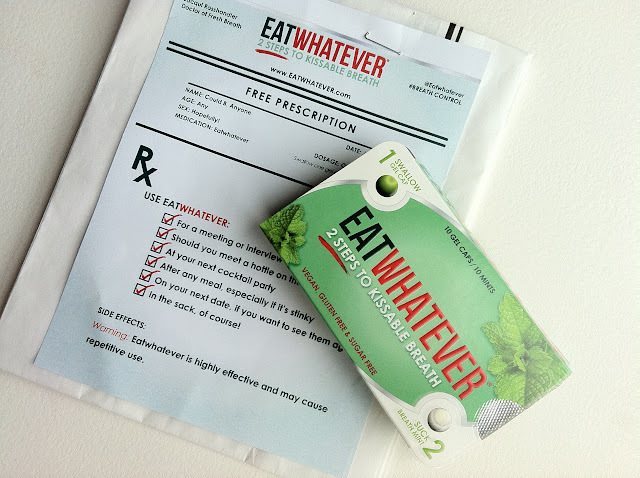 But this week my mail included a pack of Eatwhatever, touted as “a reliable breath freshener for many professionals such as chefs, restaurant and food critics, media, makeup artists, dentists, massage therapists and actors who have to work closely with others on-screen.” Turns out it was just what the doctor ordered. Why? Well, if you’ve been reading my Twitter feed lately, you’d know that my husband nearly passed out the other night when I walked into the house reeking of garlic. Again. “Have you been to the Koreans?” he asked, fully aware of my great love for the garlicky goodness of Korean cuisine. “Nope: I went to see Uncle Ming,” I said, referring to the fellow who owns — and runs — Fu Man Dumpling House, well known for the garlic-quotient of its dumpling sauce (and other dishes that, I’m sorry to report, have gone decidedly downhill since I last raved about the place). In my dinner’s aftermath, word has it from you-know-who that he could have hung a steak in the bedroom that night — and not had to season it the next day. Which is why he thinks I should consider leaving a pack of Eatwhatever in the bedstand next to the Tums. Apparently, Eatwhatever — described in PR-speak is “the hottest accessory for any power suit, cocktail dress, table napkin, lingerie or birthday suit” — is the answer to Mac’s prayers. (His oft-quoted motto: “Garlic should be a condiment, not a main course.” And yes, I still married him.) If I’m to believe what I read on the breathy press-release, even Angelina Jolie is a fan. That said, I’m certain my husband wouldn’t complain about her dining habits, even if she’d just come in from a make-out session with a caesar salad, a quart of kimchi and Fu Man’s dumpling sauce. Though available since 2007, the breath freshener has been repackaged, relaunched and is apparently gearing up for a big national roll-out. I, for one, am looking forward to the day I can find it next to the Altoids at Bartell, or another local retailer. Eatwhatever ain’t cheap, but after trying it, I’d buy it. So far, it’s only available “locally” in bulk, via a certain local internet giant. Though you — and I — might consider the source.